The Southernmost House was built in 1896 for a cost of $250,000 (approximately $6 million today) by Judge J. Vining Harris, who married into the prominent Curry family. In 1939 the Ramos family purchased the property, which had been converted into a Cuban nightclub called CafÃ© Cayo Hueso (Bone Island CafÃ©), for $49,000. In 1954 it was converted back into a residence and remained so until 1996 when a $3 million restoration began to turn it into a 13-room hotel, with a museum on the first floor. 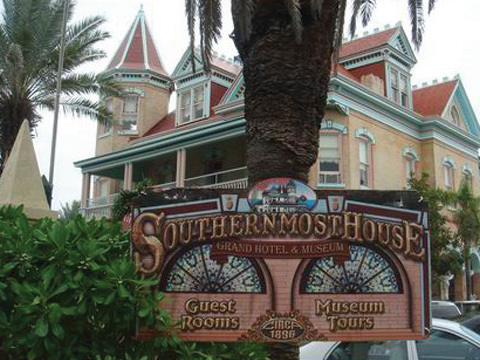 Stay at one of Key West's most memorable icons, the Southernmost House, Grand Hotel & Museum, where five U.S. presidents have stayed while visiting Key West. The house is a work of architectural wonder. The grounds are magnificent with glorious tropical gardens, a zero-entry pool, an antique wooden bar from Carson City, Nevada and four resident southernmost rabbits that delight guests with occasional visits. A Tiffany stained-glass canopy, originally made for an Italian villa, now makes an idyllic setting for wedding and commitment ceremonies. Today 43 U.S. presidential signatures are on display including William Henry Harrison's, which is a rare piece of historic memorabilia, as is President Johnson's original swearing-in statement. Artifacts and treasure salvaged by Whitey Keevan from the shipwreck of a Spanish galleon are also on display and for sale. The Ernest Hemingway room boasts a large collection of written memorabilia including letters to friends, relatives, and professional acquaintances. The Ernest Hemingway room boasts a large collection of written memorabilia including letters to friends, relatives, and professional acquaintances. Exterior paint colors are authentic, as are elegant crown moldings, ceiling medallions, ornamental woodwork and friezes, which were originally painted white, but have been redone in splashy shades reminiscent of its days as a Cuban nightclub.